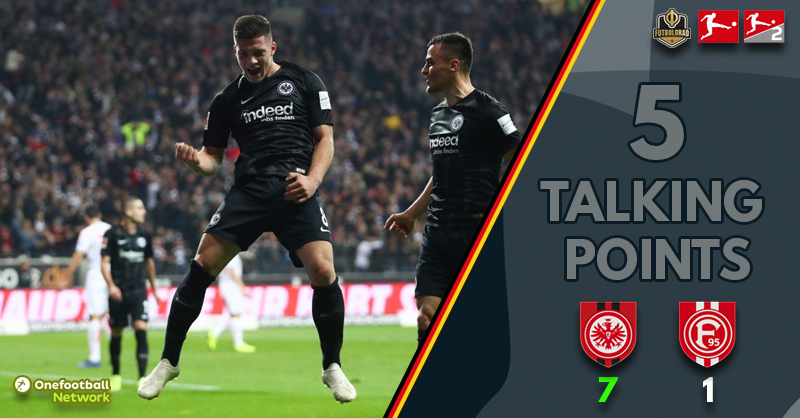 Eintracht Frankfurt demolished Fortuna Düsseldorf 7-1 at the Commerzbank-Arena with Luka Jovic becoming the youngest player to score five times in a game in Bundesliga history. Strike partner Sébastien Haller bagged a brace and put in another strong performance, but the game belonged to the 20-year-old Serbian who could do no wrong. The hosts ran riot over a Düsseldorf side that were outclassed in every facet of the game. Fortuna sink to the bottom of the Bundesliga after four straight defeats while Eintracht continue to climb the ladder after their fourth straight win in all competitions. 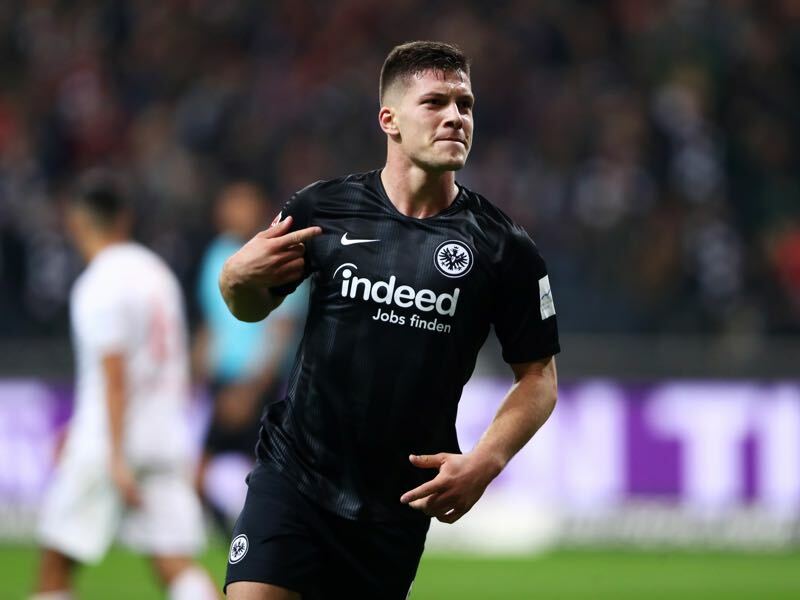 Luka Jović quietly went about his business last season, appearing mostly off the bench but still collecting eight Bundesliga goals in 929 minutes of action. He scored the winning goal against Schalke in the 1-0 DFB-Pokal semi-final victory but was an unused substitute in the final. Jović might have been flying under the radar this season, but the young striker has burst into life with eight goals in his last four appearances. Scoring five goals in one game is a rarity in professional football, but in doing so Jović displayed all the skill he has been showing at Eintracht on a regular basis. Filip Kostić delivered a cross that was slightly behind Jović but he somehow twisted and unleashed an unstoppable left-footed volley past Rensing for his first. He was on the spot to fire in his second after a layoff from Haller and was too strong and clever with a spin and shot for his third. The ball was a magnet for Jovic by this point. It was little surprise when the ball ricocheted straight into his path, and with another spin and shot that hit the post and went in he made it 6-1 with his fourth. There was time for more, Haller’s cross finding Jovic who headed in for his fifth. Sometimes everything falls into place and for Luke Jović, it was tonight against Fortuna Düsseldorf. He may never score five goals in a game for the rest of his career and it was an honour and privilege to see it live. Experience the atmosphere at the Commerzbank-Arena! Book your European football travel now by visiting Nickes! Sébastien Haller was involved from the opening minutes, unable to control a cross from the right wing before beating Adam Bodzek for strength to start a dangerous break. The French striker then bamboozled Matthias Zimmermann and crossed to Filip Kostić who shot wide. Haller stepped up for the penalty to put Eintracht ahead despite Michael Rensing getting a hand to it. His ability to drop deep and initiate attacks was on frequent display before a lovely piece of skill in a tight spot in the box produced an assist for Jovic’s second goal. Haller saw a close range header kept out by Rensing but just after half-time he was in position to collect a deflection and chip the onrushing Rensing to make it 4-0. Haller should have had his hat-trick a minute later, collecting a long ball and holding off Kaan Ayhan with his shot saved by the busy Rensing. 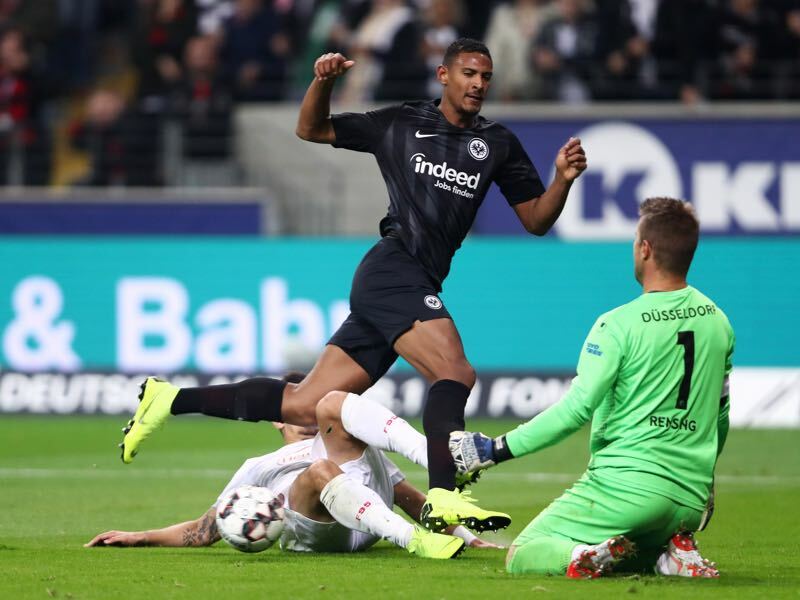 Haller started the move that saw Kostic set up Jovic for Eintracht’s fifth and produced his second assists of the game with a pinpoint cross for Jovic’s fifth. There was another chance to grab a deserved hat-trick, collecting a long ball from substitute Marc Stendera, rounding Rensing with his shot blocked from a tight angle. Have no doubt that Haller is an exceptional striker who has all the attributes including skill, speed, strength and an uncanny knack of starting attacks and providing assists. That’s five goals and five assists in the Bundesliga so far and I expect much more from Haller who continues to improve along with his teammates. A 7-1 score line usually signifies a thrashing and this game was no exception. However, it could have been much worse for the visitors who were never in the game. Lucas Torró saw a left footed volley tipped off bar by Rensing, the Düsseldorf keeper clearing a Haller header off the line before Evan Ndicka hit the bar. That was all before half-time. Dodi Lukebakio pulled one back to make it 4-1 but normal service resumed with Frankfurt running away with the game. Both teams lined up in a 5-3-2 formation but at times it appeared the home side had an extra man in midfield. Fortuna Düsseldorf offered very little in the first half, unable to compete in the middle of the pitch and no penetration out wide. The visitors hadn’t looked like scoring until minutes from half-time, Benito Raman couldn’t control Jean Zimmer’s cross and Marvin Ducksch’s shot was saved by Kevin Trapp. Friedhelm Funkel’s personnel and formation changes at half-time were positive, the 4-2-3-1 working for a while with Kevin Stöger looking lively. Lukebakio’s goal rounded off a good start to the second-half before Frankfurt resumed their dominance, Düsseldorf unable to sustain pressure for any significant amount of time. It’s not happening for Benito Raman despite getting into attacking positions, while Marvin Ducksch and Rouven Hennings are finding chances hard to come by. Diego Contento has only played 22 minutes off the bench in the DFB-Pokal, Aymen Barkok made his first appearance of the season off the bench against his parent club, but it’s currently difficult to see how this team will survive. Funkel’s side have now lost four in a row and are being outplayed on a regular basis. The 64-year-old has a huge job on his hands if he is to drag Düsseldorf off the floor of the Bundesliga with only six goals scored and 18 conceded, the worst defence in the competition. Adi Hütter will be thrilled with a big win to start a run of six games in 24 days. Missing only the injured Marco Fabián, Hütter has a deep squad that can cope with the heavy schedule. Lucas Torró went off at half-time with Marc Stendera slotting in seamlessly and let’s not forget Ante Rebic was suspended for this match. With Eintracht winning their last three home games and scoring 15 goals in the process, they are turning the Commerzbank-Arena into a real fortress behind their passionate and vocal home support. Apollon Limassol are next to visit on Thursday, and Frankfurt should be able to put on another show in the Europa League before returning to Bundesliga action with away matches at Nürnberg and Stuttgart. The ceiling is very high for this team. We are seeing the pieces falling together for Frankfurt and Hütter is getting the most out of a very talented team that shouldn’t be underestimated.